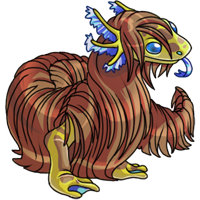 Gongong are mostly-aquatic Verpets which dwell in the vast caverns underneath the Island of Verpets. They have large three-pronged feelers on each side of their head that are often mistaken for ears, and a forked tongue that also aids them in sensing food that may be in the water. The Gongong is covered in insulating membranes that are often mistaken for fur. These membranes are vascular, and help the Gongong pull oxygen from the water in addition to keeping it warm. Personality is not often a word used to describe a Gongong. They concern themselves almost exclusively with finding food, and with their hunger satisfied they are more likely to sleep than play. Though their eyes are large, their vision is not very acute, and on land they are easily startled by sudden movements. Gongong dwell almost exclusively in deep pools of water where they can hunt. They rest amongst rocks where they are safe from predators. If it is in a pinch, the Gongong has the ability to flee onto land to avoid predators.